Our pilots have a broad array of varied backgrounds, but we all share our love for flying — formation flying in particular. Below are some short bios for some of the pilots on our team. Randy's call sign is "Deuce" – as in Acey/Deucey, the Navy version of Backgammon. Randy was an Air Force kid and had a fascination with airplanes ever since he could recognize them. He received his license in 1974 flying out of Long Beach and learning spins over the Queen Mary. After flying 200 or so hours in SoCal, flying was put on hold due to a long series of job transfers, relocations, kids, etc. 25 years later, after the kids were gone and time was available, Randy got back into flying and did the "spam can thing" for a couple of years. He then made the brilliant decision to build an airplane. In his RV-7A, Randy started learning "what flying is all about" – weekend trips with his wife/navigator to Sedona, Monument Valley, Mexico, Victoria Island, BC, not to mention fly-ins with the RV community and aerobatics. Then the real discovery – formation flying. Scott earned his Private Pilot's license upon graduating from high school and has been flying out of Watsonville, CA ever since. He earned his instrument rating in 1998 back when instruments were still round. In 2003 he bought his RV-6A after deciding that while there was no better plane for his mission, he needed to fly more than he needed to build. He has since replaced all the gyros with solid state equipment that is as happy upside down as he is. Scott develops game software for a living but would rather be flying. Chuck learned to fly in 1987 and liked it so much he decided to make it his career. He has over 13,000 hours in 40 aircraft types ranging from an Aeronca Chief to a Boeing 767. 1400 of those hours are in the RV-8 he completed in 2001. Eddy started skydiving at age 15, and by age 16 he was flying gliders and Zlins in Romania, a former communist block country. After moving to the US, Eddy began flying paragliders and competed in many events, winning two 1st place awards. Eddy started building his first plane, a Murphy Elite, in 2002. He sold it in 2005, at which point he built the 200hp RV-8 named "Eddy Special," which he finished in 2007. As soon as his Phase One was complete, he began formation flying under the instruction of Dan Checkoway. Eddy considers formation flying the best and most challenging aspect of flying. David Richardson finally earned his pilots license in the mid 70�s after a couple thousand hours of ultra light and hang glider time and wanting something �a lot faster� . After 5 years of construction David flew his RV-7 in August of 2008 and racked up 340 hours of RV flight time in the first year including a cross country trip From Los Angeles to Kitty Hawk and back . Soon after completion David started formation flying under the patient eyes of Dan Checkoway. David attended the West Coast Formation Clinic in 2009. Professionally David is a Television Specialist for the State of California Assigned to the Office of The Governor, currently Arnold Schwarzenegger where he shoots and produces live webcasts world wide. David Enjoys flying his RV to work preferring to fly his RV to events instead of flying commercial. David is a FFI Wingman. David Leonard earned his Private Pilot's license in 1997 while attending Navy Flight Surgery School in Pensacola, FL (now a Navy Anesthesiologist). He has over 500 hours flying time with Instrument and Multi-Engine endorsements. As a flight surgeon he has accumulated training time in the F-5, P-3, and TH-57 helicopter, as well as formation time in the T-34C and the F/A-18. David now flies the RV-6 he built over a 5 year period. His RV-6 is unusual in that is powered by a Wankel rotary engine. This is where he gets the call sign "Rodoc." You may notice the different sound it makes. Rodoc is an FFI Wingman. Paul Rosales, the son of a Private Pilot / A&P, grew up in the aviation-rich Antelope Valley, California, and he completed his Private Pilot training in 1979. For the next 21 years, he along with wife Victoria, rented aircraft and accumulated 350 hours total time. They started building their own, custom RV-6A aircraft in 1995 with first flight in the summer of 2000. Since then, they've flown their plane over 3100 hours to 49 States in America and 5 foreign countries: Bahamas, Canada, Cayman Islands, Mexico and The Turks & Caicos. When not flying, Paul works as a Systems Engineer for Lockheed Martin Skunk Works and occasionally as a substitute school teacher (grades K-5). Their plane is hangared in Southern California at the Rosamond Skypark (L00), located west of Edwards AFB. Brad took his first airplane ride with his father in 1968. In 1978, at age 17, he earned his pilot's certificate. Two months later he got his driver's license. Over the years, Brad has flown formation in several classic & experimental aircraft and chose the RV-4 as the ultimate formation machine. In 2000 Brad completed and first flew his RV-4. From 50mph to well over 200mph, the RV-4 is completely maneuverable and a joy to fly. Brad is an FFI Wingman. Mark DuLaney (callsign-DULA-) is flying an RV-6A, white with Maroon and Blue striping. The aircraft was built in 1998 and purchased by Mark and his wife Pat in June 2000. Since then they have accumulated about 600 hours flying to numerous destinations including EAA AirVenture at Oshkosh, WI. Mark soloed when he was 16 years old and earned his wings with the US Air Force in 1974. He accumulated 4000 hours in the T-38, F-4, F-5 and F-16 and retired from the Air Force after serving as the Aggressor Squadron Commander at Nellis AFB from 1991-1993. Currently, Mark is a Captain with Southwest Airlines and has accumulated over 14,000 hours total flying time. Mike is a retired USAF Colonel. He has been flying as a pilot for 42+ years. He flew numerous Air Force trainers and mostly ground attack fighters – T-37, T-38, T-39, F-5A&B, A-1E,G,H,&J, A-37, and A-7D. Mike instructed in most of them and has about 2000 hours of instructor time. He flew 138 combat missions in Southeast Asia, mostly supporting the CIA's "Secret War" in Laos. He has flown 37 different models of aircraft and has a total time of nearly 5,000 hours. Mike is also a multi-engineer with degrees in Mechanical, Electronics, Chemical, and Aerospace with an MS from UCLA. He was a senior flight test engineer at Edwards AFB, CA on the A-10 & F-15 doing a lot of "chase". Mike was the Director of Engineering in charge of Integration and Flight testing the Peacekeeper ICBM flown out of Vandenberg AFB, CA and the Director of Engineering at Wright-Patterson AFB, OH prior to retirement. 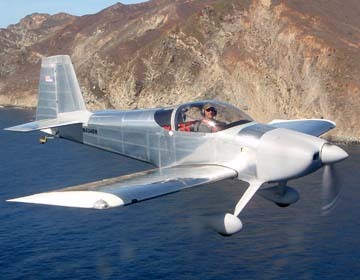 Mike's RV-7A is the second experimental he built. It was FAA certified for flight January 26, 2006. His first one was a KR-2 that he has been flying since 1983.